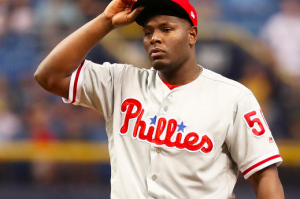 A month after Hector Neris lost his job as the team’s closer, the Philadelphia Phillies have dropped him from the roster completely. On Monday, the Phillies optioned the 29-year old Neris to triple-A. On the season, Neris is 1-3 with a 6.00 ERA. The move comes one day after Neris failed to close out a game against the Brewers. Phillies manager Gabe Kapler put Neris in the game in the bottom of the 9th with Philadelphia leading 10-5. Neris proceeded to give up four runs, including two home runs that brought the Brewers within one run of tying the game. With one out left to get, Kapler bailed on Neris and had Jake Thompson record the final out of the game to secure the win for the Phillies. Sunday’s game was the final straw for the Phillies as it pertains to Neris. After saving 26 games last season, he entered the season as the team’s undisputed closer. But things have not played out that way. Neris was excellent in the month of April, posting a 0.96 ERA. However, things fell apart for him during the month of May. He blew two saves against a pair of division rivals within a six-day span, which was enough for the Phillies to move to a closer-by-committee situation. Things have continued to spiral for Neris after losing his job as the team’s closer in the middle of May. In seven appearances during the month of June, he owns a 9.45 ERA. After he failed to protect a five-run lead on Sunday, it’s safe to say that Kapler and the Phillies have little confidence in his ability to contribute at the back end of the team’s bullpen. Even with Neris in the minors, there is no indication that the Phillies will go with a full-time closer. Edubray Ramos, Seranthony Dominguez, and Victor Arano have had impressive campaigns pitching out of the bullpen. None have been burdened with the task of being the team’s full-time closer, which may have helped things. That being said, the Phillies are still lacking in bullpen depth. The Phillies are in the bottom third of the National League in bullpen ERA. The team has blown eight saves, including three from Neris. At this point, Philly’s bullpen is closer to being a weakness than a strength. With the Phillies within striking distance of a playoff spot, a more reliable bullpen could help them immensely the second half of the season. Heading into Monday, the Phillies were four games back in the NL West, but only half a game out of the second wild-card spot. Obviously, the Phillies would welcome Neris returning to their bullpen later this season if he recaptures the form he had a year ago. At this point, there is no timeline for when Neris could return to the big leagues. However, the Phillies are holding out hope that some time in the minors will get him back on track.